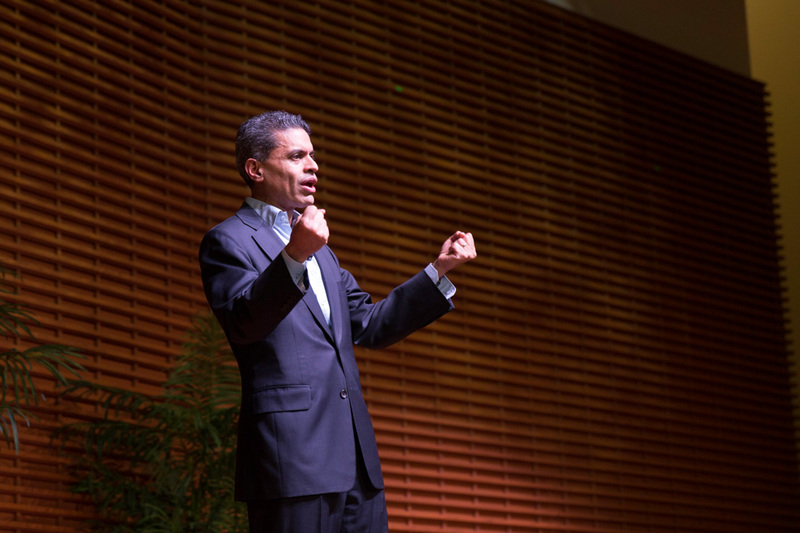 Fareed Zakaria spoke on Tuesday evening in an event titled “America in a New World,” a part of the OpenXChange speaker series (NAFIA CHOWDHURY/The Stanford Daily). The main focus of the talk, however, was technology and globalization in the world today. In a concerned tone, he explained that society will soon face a fundamental challenge of how to incorporate automation into our lives, a challenge he considered more important than ISIS or the rise of China. As an example of automation, Zakaria brought up Google’s self-driving car. He considers it a brilliant idea, but also explained to the audience that the most widespread occupation in America is to drive a car, bus or truck. 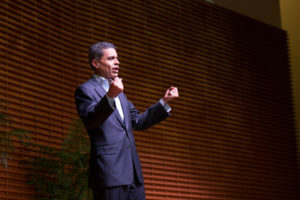 Zakaria then urged the audience to consider what will happen to these jobs when automation becomes common. “If you are an average person in a high-income country, the robots can take the jobs away,” Zakaria said. According to Zakaria, one major impact of technology and globalization has been the return of nationalism as the main source of identity. He used Russia, China, Western Europe and the United States as examples. Zakaria stated that this international shift to a nationalist, populist right is the only way in which we can understand Donald Trump’s popularity. He explained that the Republican Party has been defined by free-trade and open borders policies since Ronald Reagan. Zakaria argued that Trump was able to capitalize on the desire of the American populace to know that various disruptions around the world are someone else’s fault. Despite much of the presentation addressing the current and future problems in the world, Zakaria ended the night on a more optimistic note. “The forces of globalization and technology, which are forces of growth, are more powerful than the backlash against them,” Zakaria said. Zakaria referenced a University of Maryland study, however, showing close to the opposite. According to Zakaria, we are actually living in times of unusually high political stability and peace. Nevertheless, he noted that this is difficult for people to believe largely because of dramatic acts of terror emanating from the Middle East. According to Zakaria, the United States should not intervene in the Middle East because the region will face instability and further chaos regardless. He emphasized that, during the decades of stable dictatorships, the Middle East as a whole experienced stagnation as the rest of the world progressed and grew more democratic. According to Zakaria, the Middle East became less economically, politically and socially free from 1955 to 1995. When these “old order” regimes toppled, there was no working state beneath them — no stable institutions to maintain economic order or civil society to maintain social order. In essence, there was no real country at all. Furthermore, Zakaria said people in such chaotic areas began retreating to a sense of identity that gave them a sense of security. He made clear that these were not national identities, but rather much older identities such Kurd, Arab, Shi’ite and Sunni. Zakaria also pointed to a vicious cycle of destabilization and radical Islam in the Middle East, where chaos energizes radical Islam and radical Islam causes chaos. He expressed serious doubts that U.S. intervention could do anything to solve the problem. In his closing comments about the Middle East, Zakaria brought up a paradox of low oil prices even amidst general instability in the Middle East. Part of this has been caused by the substantial increase in American oil production, from 1 million barrels a day 20 years ago to 9 million barrels a day now. “There’s a lot of stuff going on outside the Middle East that is more important than the stuff going on inside the Middle East,” Zakaria explained. Contact Max Pienkny at maxp123 ‘at’ stanford.edu.